On June 2, 2015 the New York Times once again decided to tell the world that the people of Gaza are suffering. 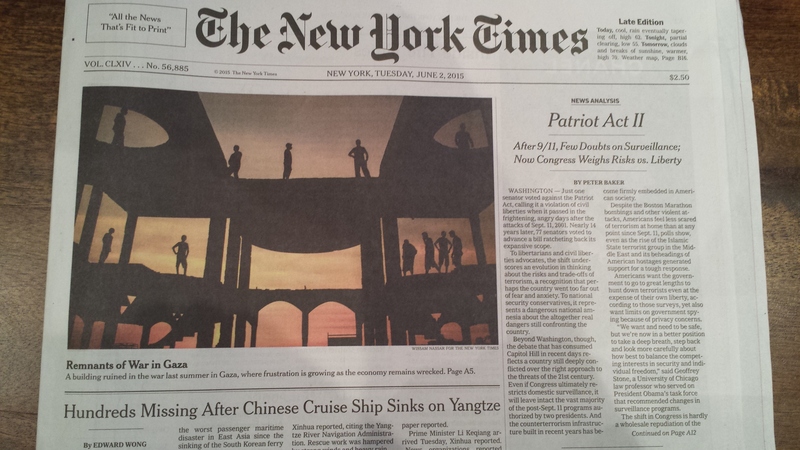 With a large color picture on the front page, the Times included another picture and article inside regarding how the Gazan community has still suffered from a lack of money, jobs and rebuilding of the infrastructure one year after the war “between Hamas and Israel.” If a reader ever wanted to learn about the scores of people killed in Nigeria, they would have to hunt inside the paper for an article on page A4 (with no picture). If they wanted to hear about the dozens of Yemeni civilians killed by Saudi Arabia, they would have had to turn to page A12 the day before. This has been a continuing pattern for the NYT, as outlined in “Every Picture Tells a Story – Whitewashing the World” where the killing of civilians around the world went under-reported, while the suffering of Gazans remained over-reported. 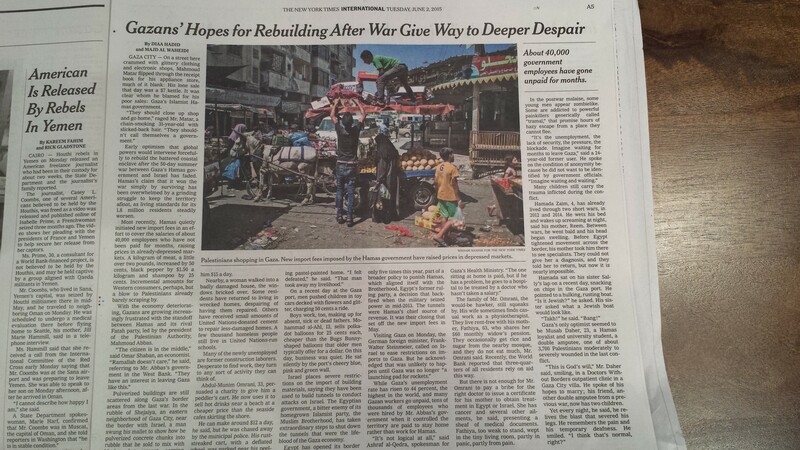 The June 2 NYT article “Gazans’ Hopes for Rebuilding After War Give Way to Deeper Despair” has continued to add to the trend of distancing Palestinian Arabs from Hamas, and Hamas from terrorism, as if everything that happened to Gazans was poor luck and happenstance. The article referred to the Palestinian Arabs’ “hope” and “Early optimism that global powers would intervene forcefully to rebuild the battered coastal enclave after the 50-day summer war between Gaza’s Hamas government and Israel “. The article never discussed their hope that Hamas would destroy Israel. The article detailed the blight in Gaza, stating “Pulverized buildings are still scattered along Gaza’s border areas from the last war. In the rubble of Shejaiya, an eastern neighborhood of Gaza City, near the border with Israel,” but did not discuss that the Shejaya neighborhood was the locus of dozens of tunnels from people’s homes into Israel to commit acts of terror. the Muslim Brotherhood, has taken extraordinary steps to shut down the tunnels [connecting Egypt and Gaza] that were the lifeblood of the Gaza economy. “Article 2: The Islamic Resistance Movement is one of the wings of Moslem Brotherhood in Palestine. Moslem Brotherhood Movement is a universal organization which constitutes the largest Islamic movement in modern times…. This is not subject to interpretation. Hamas is an integral part of the global Muslim Brotherhood movement, a group which has been actively banned and persecuted in Muslim countries such as Egypt and Syria for promoting terrorism. Distance the people from the ruling government and negative reports. Minimize the fact that Palestinian Arabs voted for Hamas, which has led Fatah in every poll since 2006. Explain that the Arabs are frustrated by the Fatah corruption so had no practical choice other than voting for Hamas. Explain Palestinian Arabs being the most anti-Semitic people in the world by using terms like “not surprising” without delving into cause-and-effect. Stop calling Hamas a terrorist organization. Use terms like “militant” sparingly, and ideally, just “Islamist”. Refer to Hamas as a political entity. Which it is, like the Nazi party was a political entity elected by the Germans in the 1930s. Quote “political leaders” of Hamas often. Never refer to the Hamas Charter, which calls for the complete destruction of Israel; murder of Jews and never accepting any negotiated settlement. Skip the long, evil Jewish and Zionist conspiracy theories- those statements are just noise that cloud the picture of Palestinian Arab suffering. Localize Hamas to an Israeli resistant movement. In a world that fears the dangerous rise of the Islamic State / ISIS, do not let Hamas get painted as part of a broader Muslim terrorist group (as described above). If you follow these steps, the Palestinian Arabs can appear as passive victims and not as active participants in a radical anti-Semitic, anti-Western regional movement to install a Muslim caliphate. Read the press today. Which rules are they using? This entry was posted in Gaza, Israel, Middle East Analysis, New York Times, Palestinians and tagged Hamas, Muslim Brotherhood, New York Times by First.One.Through. Bookmark the permalink.